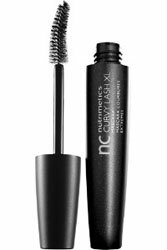 Meet the ultimate in lash-curling - nc Curvy Lash XL Mascara by Nutrimetics. Your lashes will steal the show with their long, luxurious and enviable curves. The new curved brush sweeps lashes into a dramatic curl whilst the naturally enriched formula quickly sets the curl in place. Longer, curvier lashes that last all day. Ingredients derived from Sugar lengthen the lashes, whilst Vegetal Waxes add volume before rapidly to ensure the sensational new curve stays put. The curve of the lash line is enhanced so the eyes appear larger and more open. nc Curvy Lash XL Mascara comes in 5 gorgeous shades to add character to your eyes: Black, Brown, Blue, Amethyst and Turquoise.